The Fountain of Wealth at Suntec City in Singapore is the world's largest fountain. It has a base area of 1683 sq metres and from this base area projects a huge 85-tonne (85,000kg) bronze frame resembling a tripod but with four legs. Water from the fountain shoots up to 30 metres high. 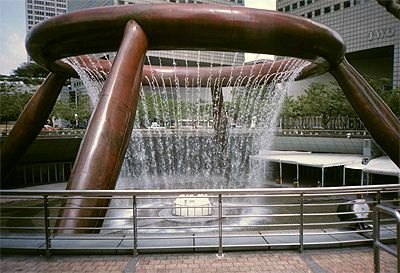 Also, from the huge ring at the top of the structure, sprays of water sluice the fountain base.